Remember I told you I was joining in with a CAL (crochet along), where a new section is added each month for twelve months? Or perhaps you have a life? 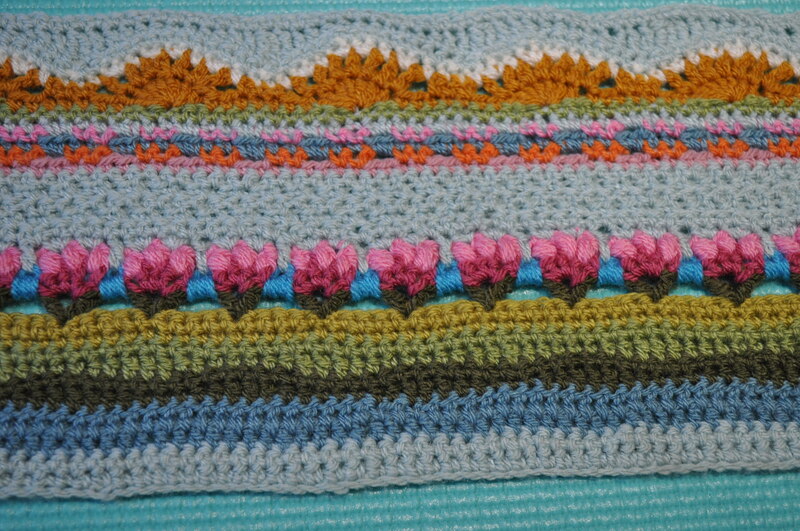 Nevertheless, I promised you puff stitch and here it is in the section for June which has been crocheted directly on top of the section for May which is the way of these things I believe. 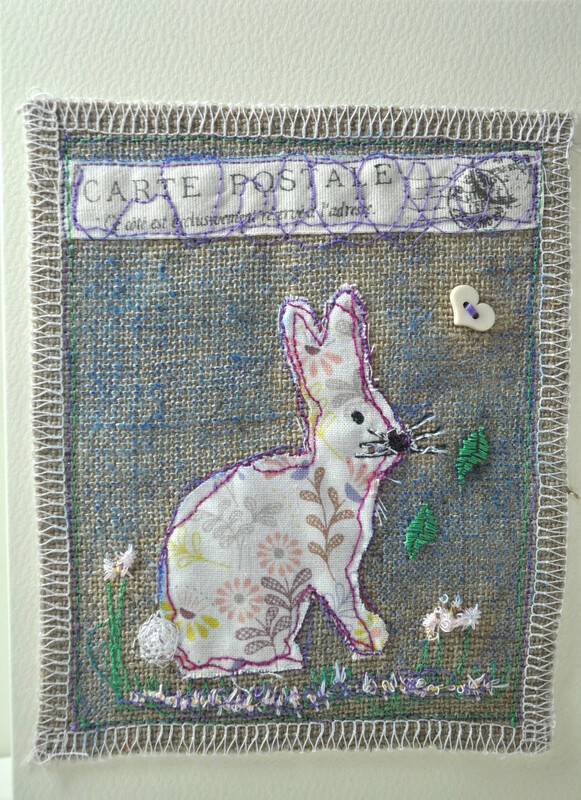 This is the ‘Sunshine and Showers’ CAL from Jane Crow – first issued monthly in a magazine last year and now available for free on Jane’s blog. 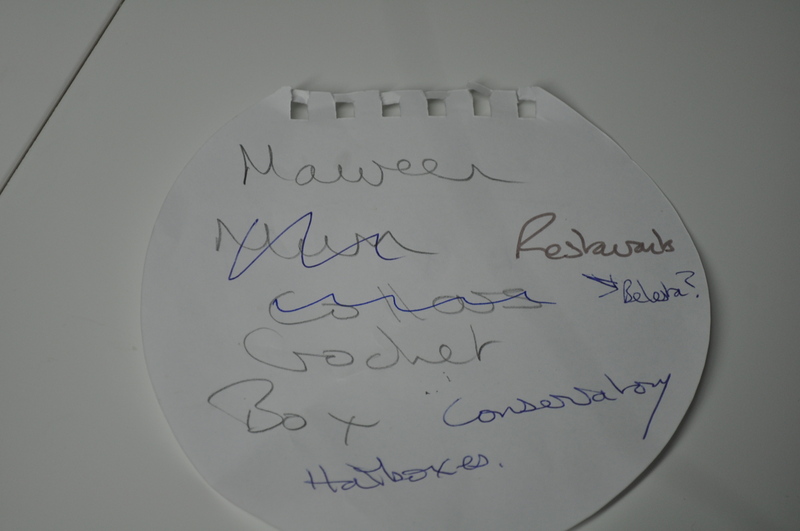 I am still a beginner really so I thought this would teach me some new skills. 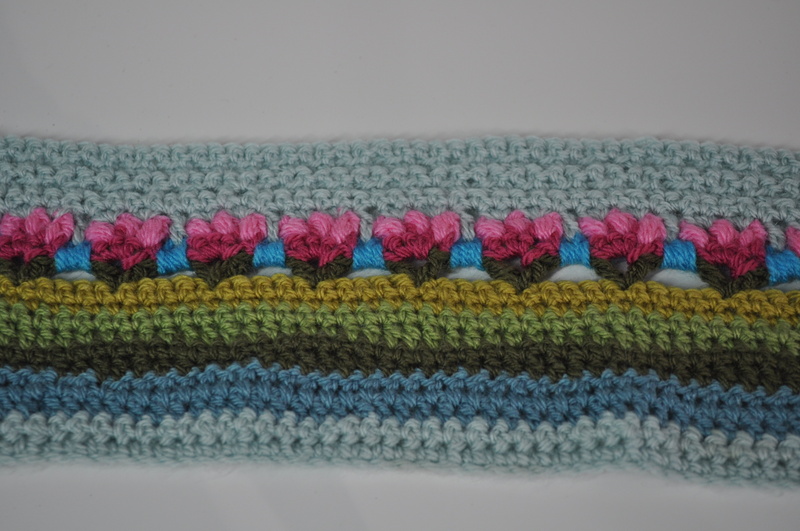 This month I learnt how to do flower stems, puff stitch, crochet into front of loop, crochet into back of loop to name just a few thrills and spills. Nobody can say I don’t know how to live. See the turquoise row? Well that had me foxed because it comes out as a sort of separate strand on the wrong side of the work at first and I didn’t think that was right so I undid it all and tried it a different way which, of course, was wrong. Eventually I found a photograph of the back of the work on somebody’s Ravelry project and realised I had done it correctly the first time. So, it would have been useful to have been given a ‘rear view’ for this particular row in the otherwise very detailed tutorial. Still, I got there in the end and am almost finished the second, identical piece ready to add on the next bit when it is issued next month. 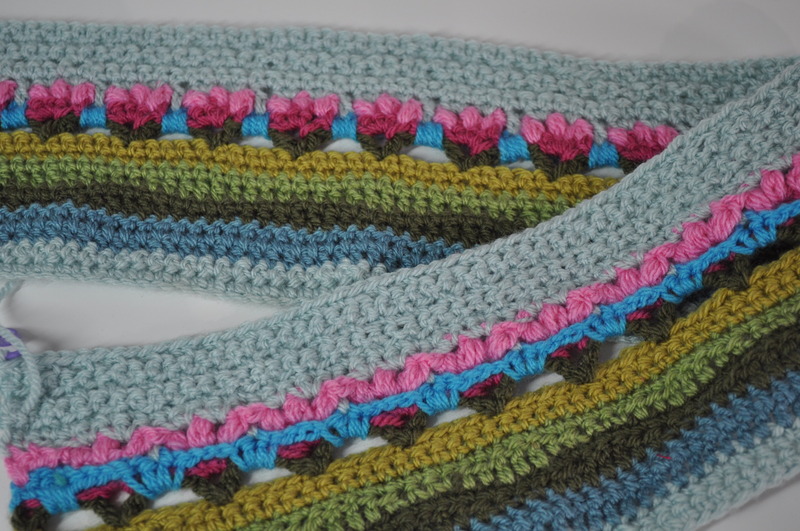 With all these different stitches, colour changes and my inexperience, I am worrying about the edges of the blanket becoming wavy – a problem some other people have mentioned on Ravelry. 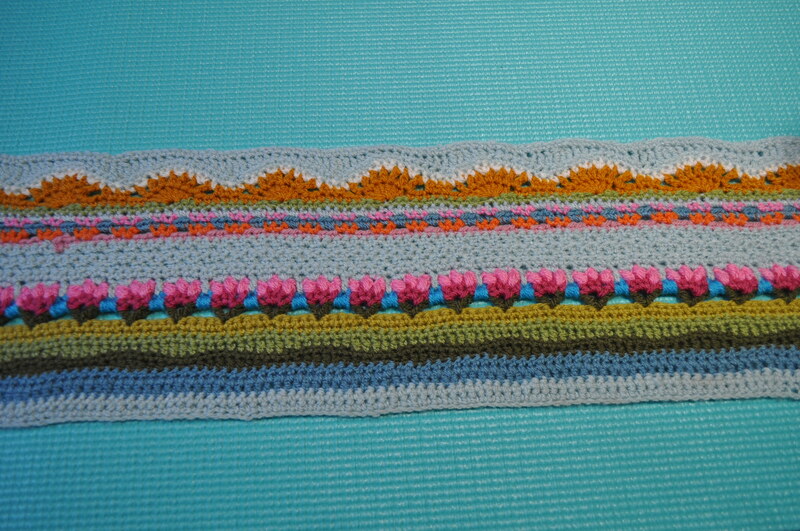 I know this yarn is acrylic but I’m sort of blocking it as I finish each section – i.e. spraying it with some water and pinning it to size – hoping it will limit the waviness somewhat. It was my birthday a couple of weeks ago and I had put two crochet books on my list which my daughter obliged me with so look out for amigurumi monsters and faux taxidermy which might, or might not, be flying off my hook some time in the future – although it will probably not be the near future. I am finding the zebra’s head a little intimidating so I might start with the mouse’s head as, with all the cats around here, it shouldn’t be too difficult to find a life model should I need one – although there probably wouldn’t be much life left in it by the time I got to it 😦 Still, they haven’t dragged a zebra through the cat flap yet so I’ll have to make do. 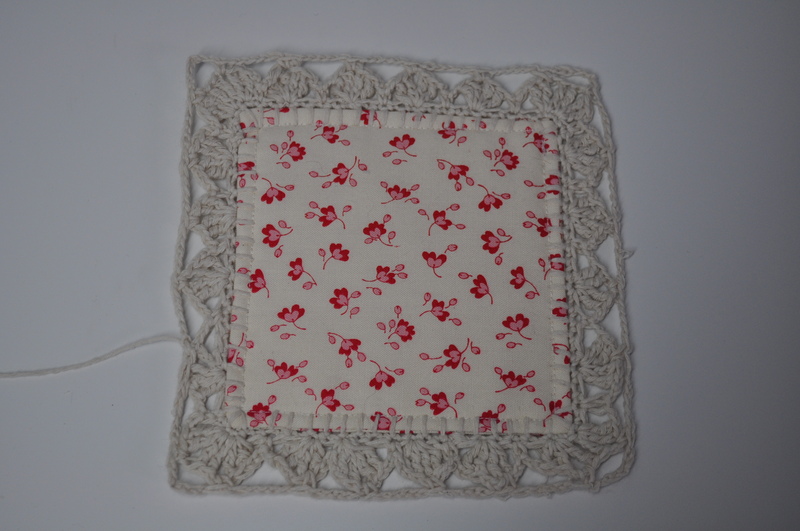 This is a proposed layout, just needs whip stitching together then an outer crochet border added. Still, it’s so pretty that it has encouraged me to get on with mine and stop moaning about the splitty cotton yarn I’m using and the 2.5mm crochet hook which both come as a shock after using a 4mm hook and DK yarn on the two other blankets I’m working on. As a bit of a diversion from all things crochet I had a commission for one of my étui cartonnage boxes but not a hexagonal one this time. A previous client asked me for one of the small boxes I make which was quite a relief as I’ve lost my box making mojo at the moment – I’m sure you know the feeling 😉 . 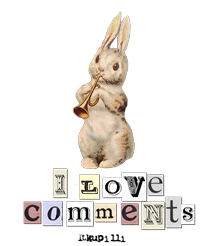 Anyway, her brief was brief but rabbits were mentioned. Off to the hairdressers in a minute to ‘have my roots done’ and when you see the photos of me in my next post you will understand why. Yes, I have been foraging for flannel this past couple of weeks. 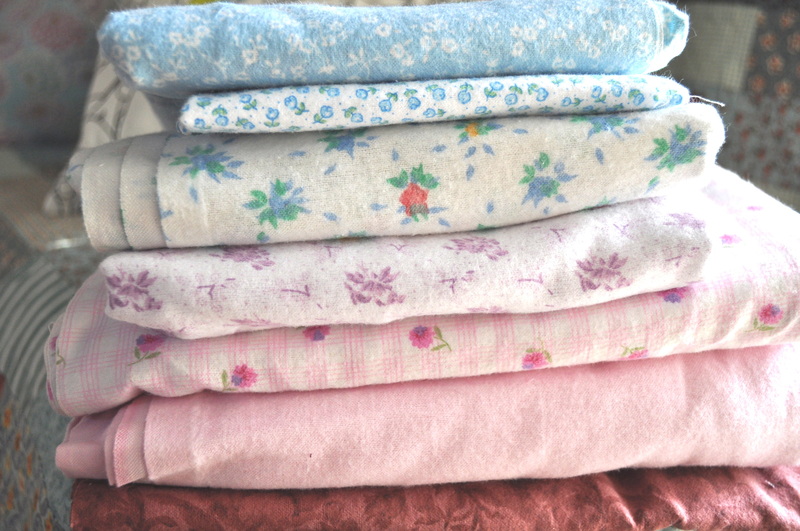 Well, I haven’t quite resorted to flannel nighties yet but I have started amassing flannel sheets and fabric for my favourite thing of the moment which is making rag quilts. 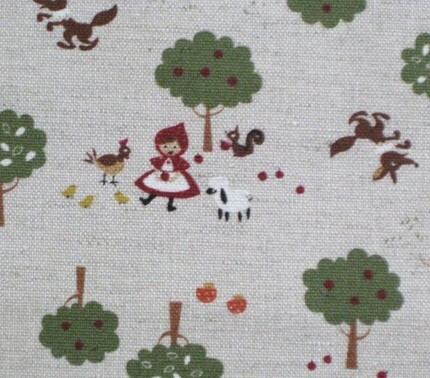 I found some vintage flannel on Ebay which came in some pretty little prints but, as it was in the U.S. the shipping cost more than the fabric so I’ll have to narrow my search to the U.K. and France in future. After scrounging some more pieces of flannel from my friend Sandra – including a beautiful soft bolster cover which I couldn’t actually bear to cut up! 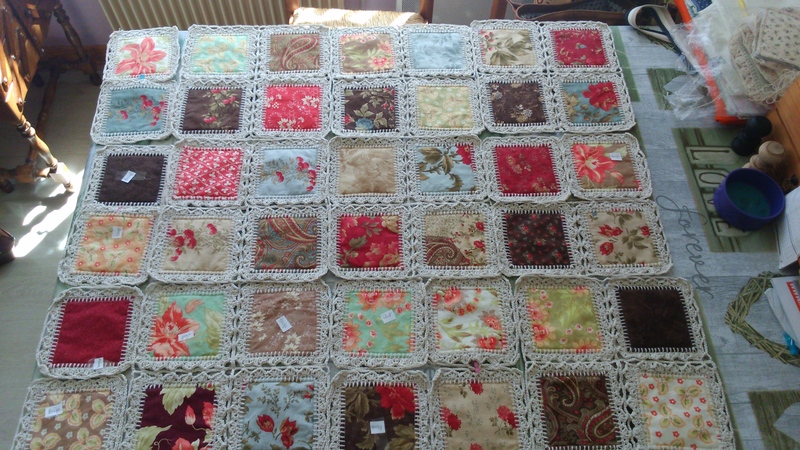 – I set about the fairly mammoth task of cutting it all into 20cm squares which I did photograph but, as the weather is so pants here at the moment, I couldn’t get a good enough picture. 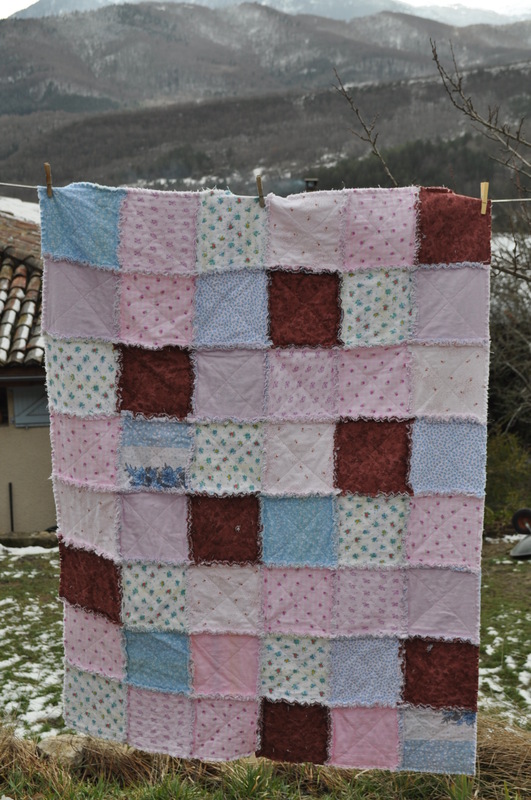 However, I am sure you can imagine almost 300 20cm flannel squares cut by hand – a big thanks here to the inventor of the rotary cutter without whom it would not have been possible or at least not have been attempted. 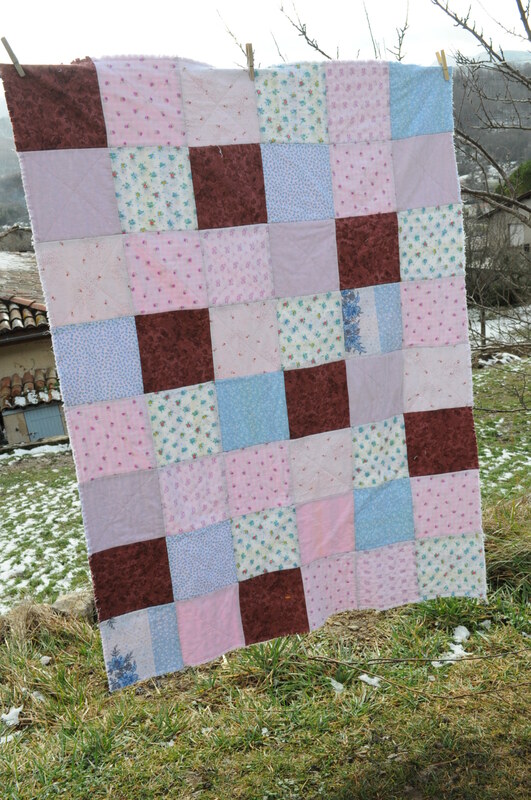 I won’t bore you with the details of ‘how to make a rag quilt’ here as I followed an excellent tutorial which, if you want to make one, will be all the information you need. The only things I did differently was to use flannel for all three layers and use bigger squares. Also, having had a go at a rag quilt some time ago and almost ended up with a claw for a hand, I invested (very wisely) in a pair of Fiskars rag quilt snips which spring back open after every cut, have blunt ends to avoid snipping your stitches and make the job so much easier they are worth every penny. Also, I went a bit ‘maverick’ and each time I joined a row of squares I snipped the seams to about half an inch of the outside edges so that it wouldn’t seem such a daunting task once all the rows were joined. Here it is after one wash. I told you the weather was grim! The amount of lint that comes off these buggers is phenomenal so, not knowing where the local launderette is, or even if there is one, I put it in an old pillow case and sewed up the end and put it in my own washing machine. You are supposed to tumble dry them too, to get the seams to go ‘fluffy’, but I haven’t got one of those so, until I go and find a launderette and case the joint to see if there is a ‘guardian of the machines’ who might object to me putting such a lint-shedding object into one of her babies, I will just keep shaking it and, with a soft toothbrush, brushing those fraying seams up. 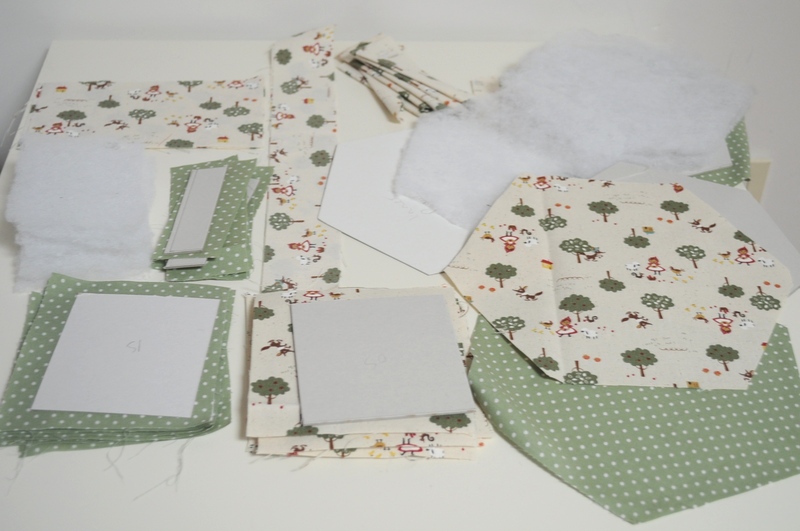 I do like the look of the soft cosy flannel and all those fluffed up seams – it looks all comfy and cuddly – but, as a bonus, the other side looks like a regular patchwork so you can always turn it over and ring the changes. 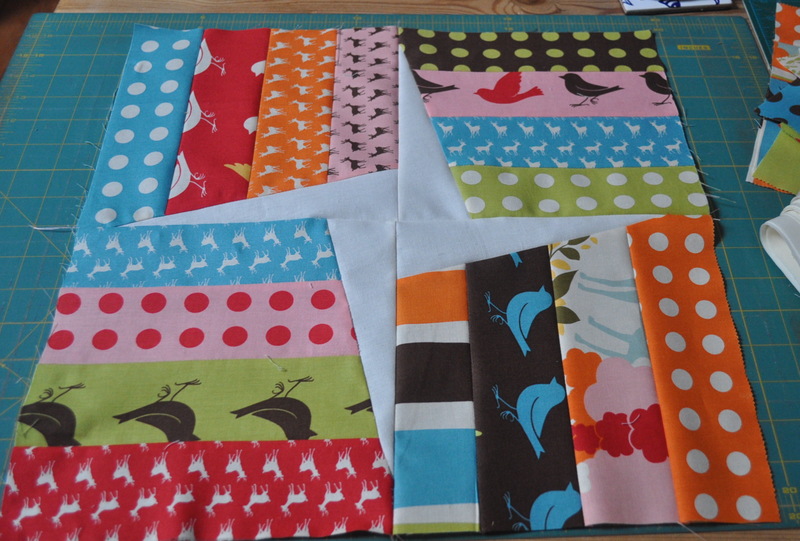 Nine days to go until my youngest’s 18th and her quilt top is ready and waiting to be sandwiched and quilted. I waited 15 days for some cotton batting to arrive from the U.S. – it’s hard to get the good stuff here – but, when it got here yesterday, I realised that it could only be quilted up to 2 inches apart and I am going for a ‘minimalist’ approach so, after all that, I have had to order some Hobbs Polydown from the U.K. which will hopefully arrive soon so that I can handquilt 25 stars and then bind it ready for the big day. It might be a teensy bit late. Just one block – there are 25 of these, just haven’t taken a photo of them all joined up yet. Meanwhile I have made another soft and cosy, towelling backed throw with some gorgeous Tilda fabric and have started piecing my Union Jack so I am not being idle. 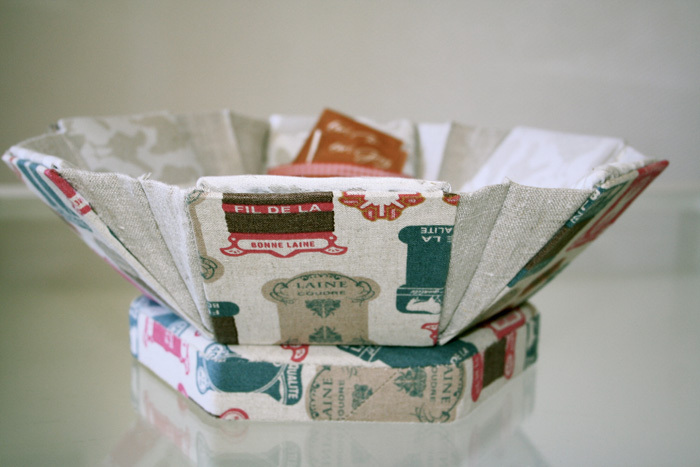 and not liking to let anything go to waste – I used the remainder of the Tilda fabric to put a roof on one of my little cartonnage house boxes. Don’t miss my next post when I will be attempting to make my own knickers! Although not, I hasten to add, in flannel. 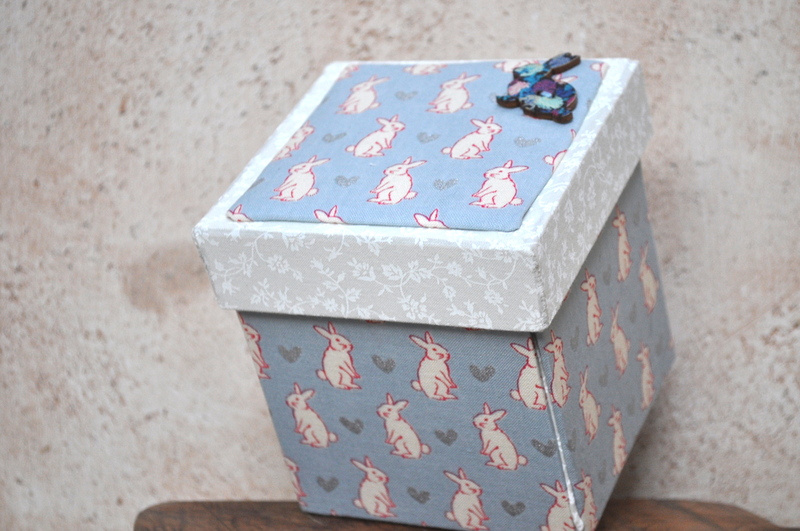 Anyway, I found some fabric that has some of her little creatures on it and, although I don’t often do cutesy, I couldn’t resist the wave of nostalgia that swept over me like a tidal wave of cherubs and pixies and elves and fat-cheeked moppets, so I have made one of my étui boxes and one of my fabric tubbies from it and let that be an end to it!! Right, I think that’s got the ‘cute’ out of my system. 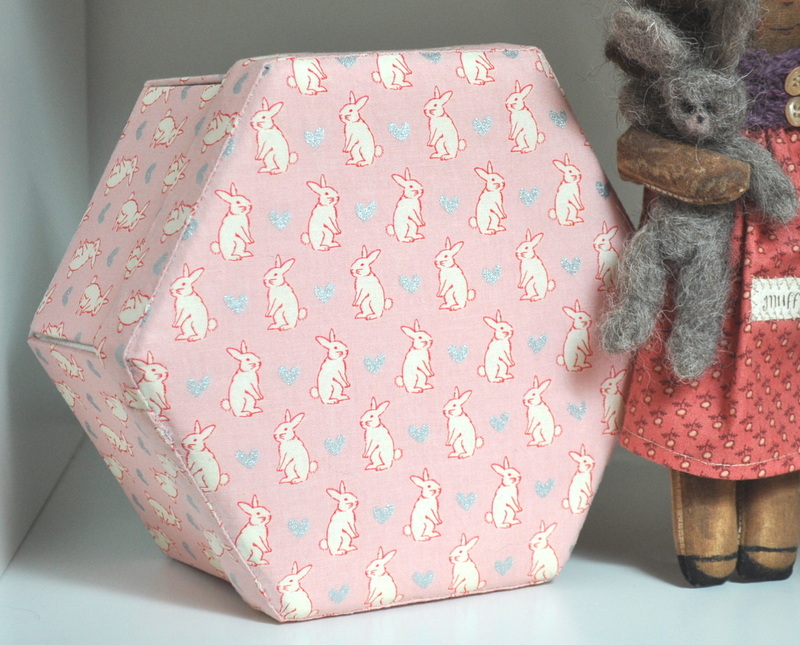 Well, I promised that next time I made a hexagonal sewing box I would show you how many different bits and pieces had to be cut out so, as I’m just about to embark on making another two, I’ve laid it all out for your delectation. I also said I’d probably frighten myself and I have. Must be mad. All the hand-cut components for one, yes, just one, hexagonal box. Bearing in mind that I’ve just spent the best part of a day, on and off, cutting out two of these, you will perhaps be amazed that I still manage to find it fun. Maybe it’s the gluey bit, I also like choosing the fabrics – not that keen on doing the teeny tiny stitches these days ‘cos it means I have to put specs on – but what I really love is seeing the finished item and imagining it being used for somebody’s sewing bits and pieces or other goodies. Anyway, I promised I’d show you but I’m off back upstairs now to get sticky. I’ll let you see it when it’s finished – you have probably noticed there’s a tea theme going on with this one which reminds me, time to put the kettle on.